It's hard to believe that after all the murders, mutilations and prison sentences Norwegian black metal progenitors Mayhem have dealt with over the past couple of decades, they've actually been together long enough to celebrate 25 years of churning out the aural equivalent of Satan's vomit. Well, now Mayhem want to celebrate that silver jubilee (would these guys use the word "jubilee?") and they're doing it in the land they barely get to touch: North America. In fact, Mayhem has never toured the U.S. proper and have only been to Canada once or twice. 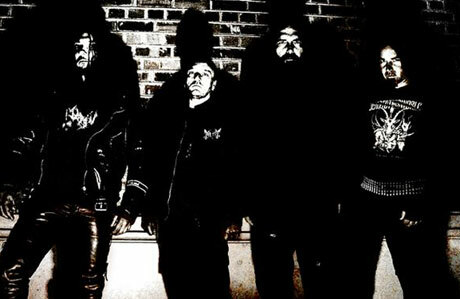 Their attempted 2007 "Deconsecrate the States" tour was canned after drummer Hellhammer injured his arm, requiring surgery. The fact that they were actually in New York City to perform last week is quite a treat. Keep a close eye on these next background paragraphs. The dates/people fly fast and it's pretty incestuous. Mayhem is currently made up of original bassist Necrobutcher (1984-1991), who was replaced by Grishnackh, the dude that killed fellow guitarist Euronymous, is responsible for starting the band Burzum and has the closest ties to the Norwegian church burnings of the early 1990s. After Grishnackh went to jail, Necrobutcher came back and has stuck around since, omitting downtime here and there. Vocalist Attila Csihar was in the band from 1992-1993, replacing Dead who blew his head off with a shotgun. After Csihar left, he was replaced by original vocalist Maniac (1986-1988). Maniac left in 2004 and Csihar came back. Still with us? Well, we've got longest-standing member Hellhammer to go. He's the drummer who joined in 1988 and plays with them to this day. He also kind of oversees all things Mayhem and at one point, circa 1994, was the only member of the band. For touring purposes, Mayhem thought it might be a good idea to have some guitars so they rounded up some unknown dudes and graced them with the black metal monikers Morfeus and Silmaeth. They are not considered actual members, though, which means they'll probably stick around forever. Mayhem's two Canadian dates are in Toronto June 14 at the Opera House and in Montreal June 15 at Les Foufounes Electriques. A full list of U.S. dates can be found here.